The waste sector spans from collection, sorting, separation, recycling, handling of residuals and safe, final disposal. The elements of an efficient and effective waste management system are multifaceted and its operations are complex. While many perceive the entire process as a ‘dirty’ business, it requires a high level of professionalism and sophistication to run a well-organized waste management scheme. It is not a surprise that a strong informal sector has evolved to cater to the unmet waste disposal needs of communities, industries and other waste generators. It is estimated that over a hundred thousand people in the Philippines work in the informal waste sector. Many of these belong to vulnerable, marginalized groups - waste pickers in open dumpsites and other dumping grounds and wandering trash collectors, haulers and buyers on-foot or using wooden carts and bicycles. World Bank Vice President for East Asia & Pacific Axel van Trotsenburg talks about his visit to Central Kalimantan as part of the World Bank's support for the REDD+ initiative. World Bank Vice President for East Asia & Pacific Axel van Trotsenburg talks about his visit to Tacloban City after Typhoon Haiyan caused destruction to lives, livelihoods and property. Despite Vietnam’s significant economic growth in recent years, there continues to be a gap between urban and rural areas when it comes to access to clean water and hygienic sanitation facilities. Many poor households in rural areas still do not have access to clean water or to a toilet. During one of our earlier field visits for the Red River Delta Rural Water Supply and Sanitation (RRDRWASS) project which began almost 10 years ago, I was struck by what a lady from a community told me. She questioned why people in urban areas have access to good water supply and sanitation services while those in rural areas do not. She said that compared to urban residents, perhaps people in rural areas were happy with a lower level of service and that the demand for better services was simply not there. At first I thought that she might be right but I later came to realise that this is not the case. There is demand for improved services in rural areas, and more importantly, people have a fundamental right to have access to those services. So what are the reasons for the gap? Availability of work has provided new opportunities for people in Honiara. Because boats to and from Tikopia are infrequent, William Kesi had to wait a couple of months before he could leave the island. William Kesi had to hitch a ride with a passing cruise ship to get from Tikopia back to Lata, the capital of Solomon Islands’ easternmost province, Temotu. William is a community helper with the Solomon Islands Rural Development Program (RDP), which uses community driven development to support small-scale community infrastructure. The program was officially launched in 2008, and is supported by Solomon Islands Government, AusAID, European Union, IFAD, and the World Bank. Now in its third cycle of grants, the program is beginning to reach not only the more densely populated areas of the six main islands of the country, but also some of the most remote and underserved communities in the country. 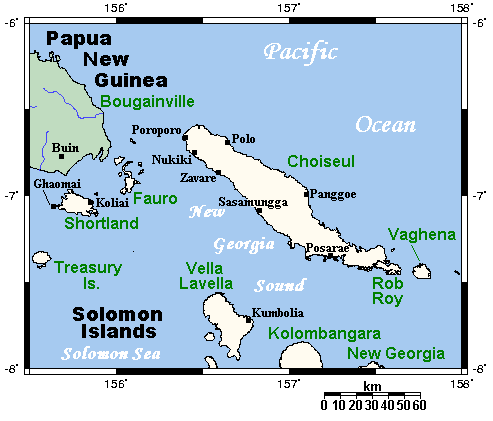 Choiseul is remote even by Solomon Islands standards: some parts of the province are one hour away by boat from a telephone, and two days by ship from the capital.